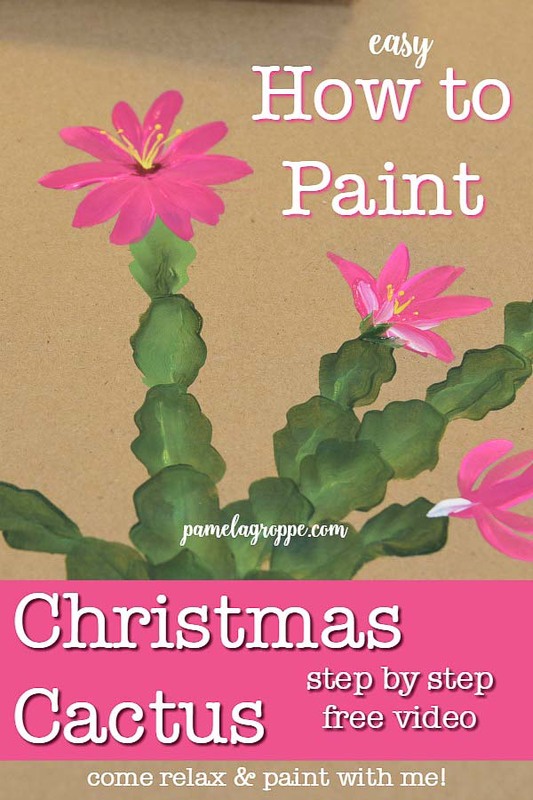 Easy step by step of how to paint Christmas cactus plant. 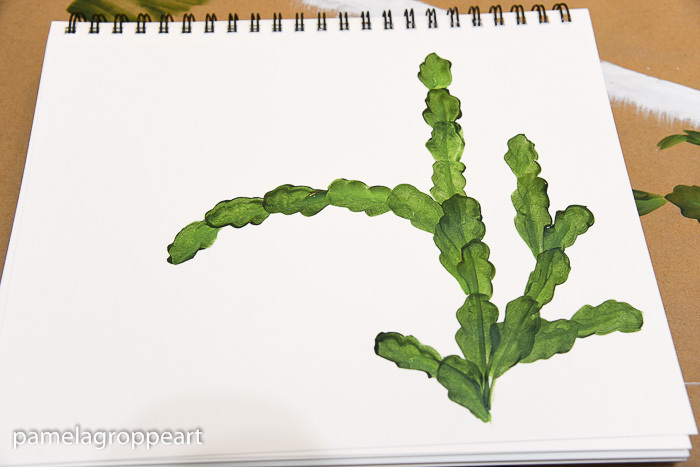 This is not a cactus painted for Christmas, this is the houseplant step by step painting tutorial with free video. Both the leaves and flowers. Come paint this winter blooming beauty with me. 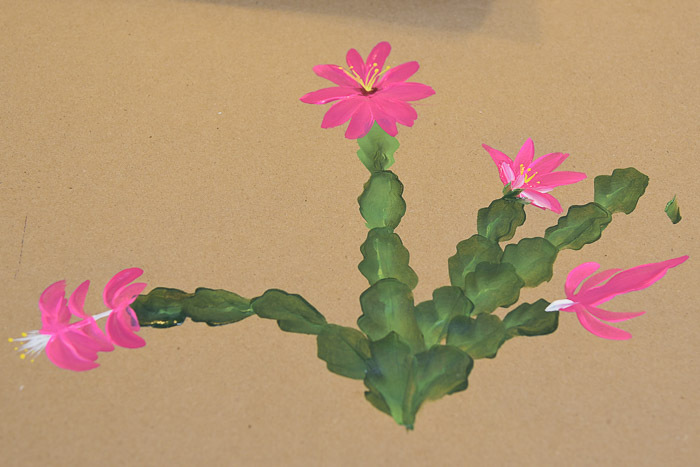 How to paint Christmas cactus plant one easy stroke at a time. I sent out a question to my subscribers of what they would like me to show them next and this lesson was what they chose. So lets get painting. 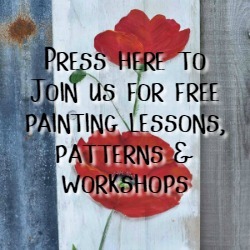 If you would like to receive email updates of new tutorials, patterns and workshops just fill out the form lower down in this post, or use the red box at top of this page. No time to read now? PIN for later. There are so many steps in this one that the photos will be more limited but they video shows you it all. I will release a workbook with the photo step by step for those that would like one to use when offline. Also a free pattern is available in the Subscribers Resource Library. A form is available to fill out below if you are not yet a subscriber. A full list of supplies is available below. 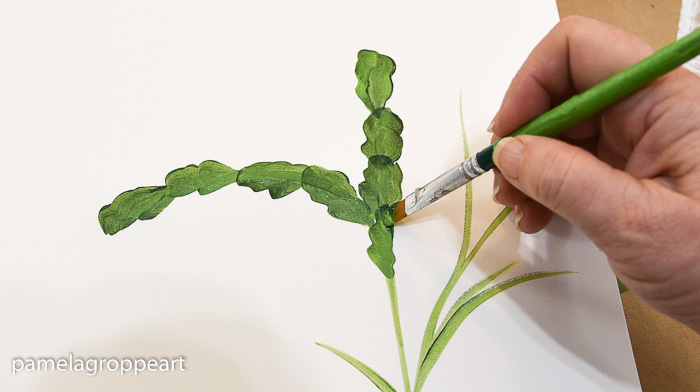 Starting on the chisel edge of your brush, draw the lines as a guide for your bracts of leaves. Reload the brush and start at the top of a bract line. Start on the chisel edge, press slightly as you slide your brush upward with a slight wave. The top is not pointed but flat so bring your brush slightly over to the right when you reach the top. Just slightly, you don’t want to make it too wide. Then pull down the other side making the same slight wave to complete the leaf bract. 2. 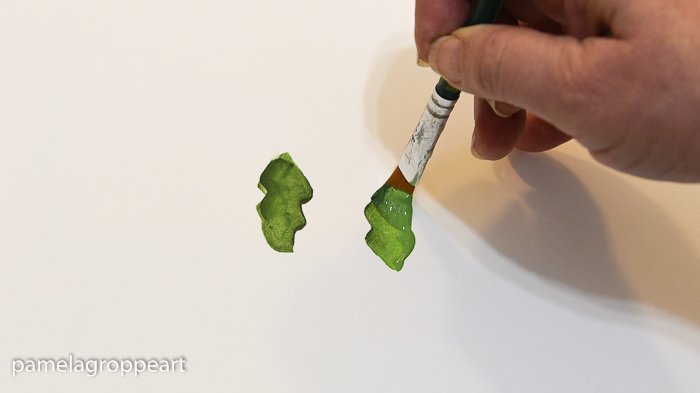 Paint your leaves overlapping each other at the base, (this is why you start at the top). Note how the top of the leaves is on the flatter side. 3. When you come to an intersection of stems then overlap two leaves with one leaf as seen here. 5. 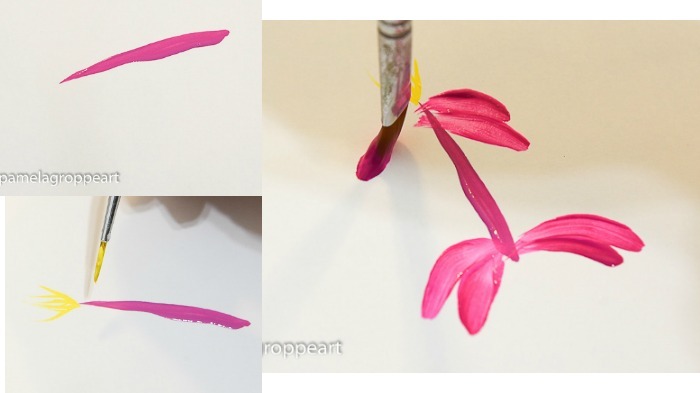 Double load a clean #12 flat brush with Fuchsia and Bright Pink, starting on the chisel edge drag daisy like petals towards your center point. 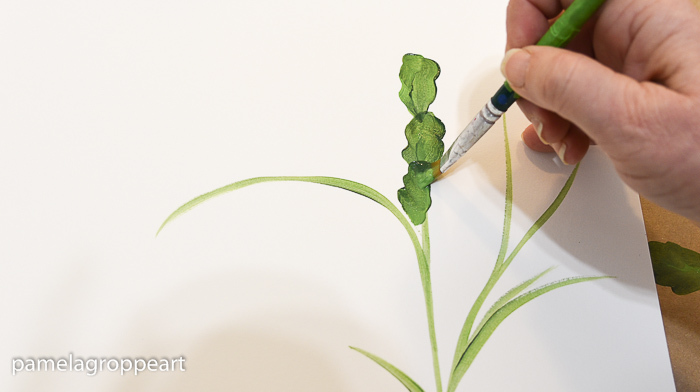 (for more on this visit here: Paint a Simple Daisy) The video also has the step by step of this, take note of how the lower petals are shorter and slightly curved. 6. Using Berry Wine and the very corner of you #12 flat brush stroke in some dark streaks in the center to add depth. 7. Using a liner brush and some Daffodil yellow add some stamens to the center. 8. Double load the #12 flat brush. Using the chisel edge pull a long stroke with a point at the end. 9. Using the script liner and inky Daffodil yellow and Wicker white pull some tiny stamens from the pointed end of the long stroke you just pulled in the pinks. Here in this photo you see what you are aiming for, it is the flower to the far left. 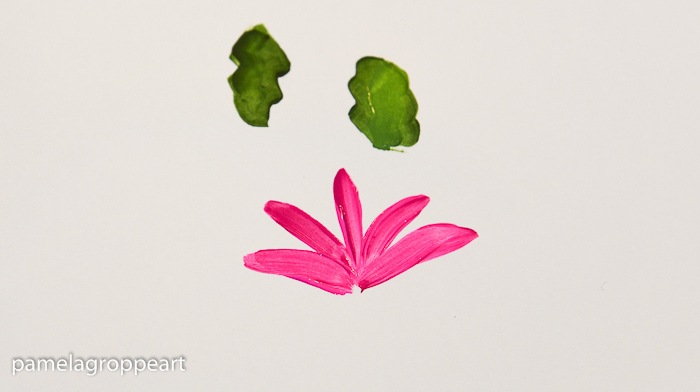 The rest of the flowers are modifications of these two main flowers and they are shown in the video. You can use what colors you have, Christmas Cactus come in many colors, Click here for a post on growing Christmas Cactus. Did you want the traceable pattern for this? 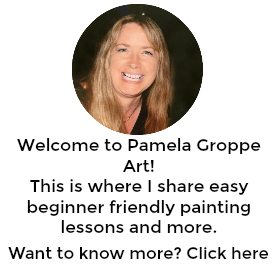 It is in the Subscribers Resource Library, if you receive my emails the password is in every note you receive from me. If you are not a subscriber please click the button at top, fill out the form to get access to your free pattern.